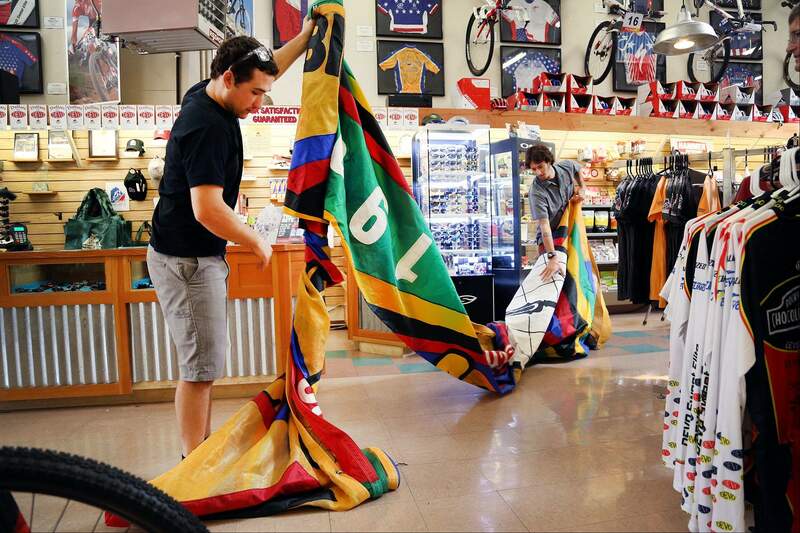 Jeremy Thompson and Charlie Domas, of Mountain Bike Specialists, unfold a banner from the 1990 World Bicycle Championship that was held in Durango. The banner went missing for 22 years until it was recovered by champion Ned Overend at a mountain biking celebration in France in June. 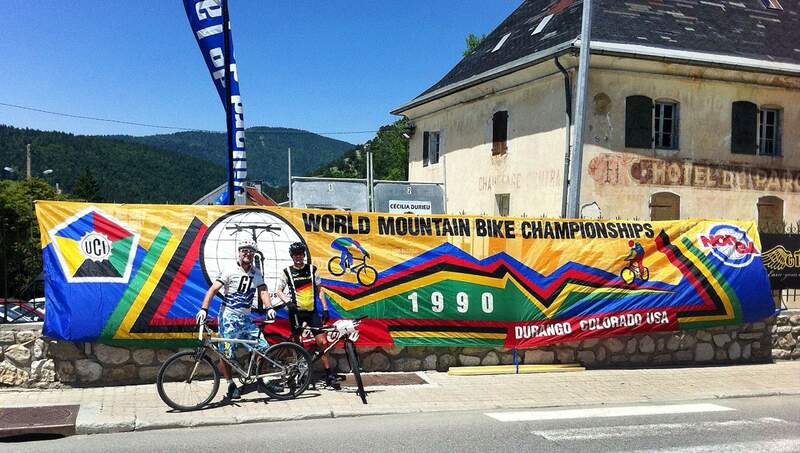 A banner from the 1990 World Bicycle Championship was missing for 22 years until it was recovered by Overend at a mountain biking celebration in France in June. On the night of one of Durangos biggest triumphs, hosting the first-ever world championship of mountain biking, the sky above Purgatory Mountain let loose with a deluge, recalled participants. People scattered from the storm at the Durango Mountain Resort. By the next morning, Purgatory had gained 18 inches of snow, but had lost the races start/finish banner that had been strung between two 40-foot tall poles. Designed by local artist Metja Swift, it was one of the events two banners. The other was hung across Main Avenue and has since become a wall fixture at the Mountain Bike Specialists shop. A thief in the night apparently had taken the banner that had been photographed with champion Ned Overend crossing the finish line. The local organizing committee felt violated by the prank, said Ed Zink, the committees chairman and owner of Mountain Bike Specialists. Efforts were made to ferret out the culprit and return the banner to Durango, but leads went cold and hope was fading, Zink recalled. We feared the banner was just lying in the back of someones closet, or worse had been thrown away by an embarrassed middle-aged couch-surfing ex-racer, Zink said. Then came a rendez vous in the French Alps when Durango mountain biker Ned Overend went to the town of Villard-de-Lans in June to commemorate a mountain bicycling championship he won 25 years ago. Incidentally, the French competition also claims to be the first world championship for mountain biking, but the Durango bases its distinction on being the first competition to be sanctioned by an international governing body, the Union Cycliste Internationale, Overend said. Because the 25th anniversary of the French race celebrated the history of mountain biking, it was fitting that Overend found Durangos lost banner strung across the main street of Villard-de-Lans. It was a surprise, Overend said. Overend got the banner back during the festivals ceremonial dinner, but this piece of Durango history has been not been hiding in a trunk in Europe for all these years. Rather, the banner has been as close as Southern California, stolen by one of the racers from the Durango competition who thought of it as a big souvenir, Overend said. He became remorseful, but did not know how to return it. Rey has kept the identity of the thief a secret. What difference does it make as this point? Its just nice to get the banner back, Overend said. Zink said there are discussions to display it at the Cycling Village at Fort Lewis College during the USA Pro Cycle Challenge in August. Durango is the starting point Aug. 20 for the professional bicycle race across the Rockies. The banner will remind people of Durangos role in mountain-bike racing. The world championship in 1990 is key not just to mountain-bike racing, but also to Durangos part in mountain biking, Overend said.